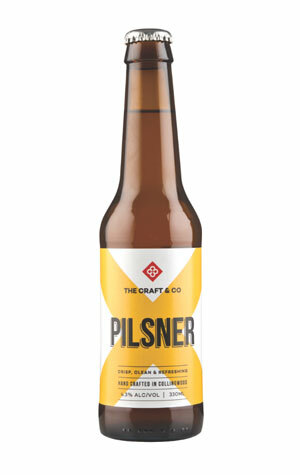 While, for the most part, The Craft & Co’s pilsner is a traditional take on the style, it does add one slightly modern twist. Sure, it pours a pale golden with a creamy white head and light carbonation and the presence of the hop Saaz puts out aromas and flavours of an earthy spice. Yet the inclusion of the wonderfully named and underused New Zealand hop Sticklebract adds a modern twist to the pilsner and contributes some light notes of citrus alongside Saaz’s herbal aroma. True to tradition the pilsner does spend more than four weeks in the tanks being lagered, which is likely what contributes to the beer’s crisp and clean flavours, which come paired with the beer’s bitterness and a slightly dry finish.